Medical staffing will prefer the PDA and Smartphones for compactness. Co-ordinating staff will prefer a larger screen of a tablet or mini-tablet, preferring to remain mobile for the majority of the time. In extremely busy period at the beginning of the Out of Hours period - a PC might be more suitable. Ward staff will require a Tablet or a PC. The operating systems of those mobile devices are complex; Android, iOS and Windows Mobile to describe the most common. We're developing constantly to ensure that the iBleep system works regardless of the technology. Those devices are going to be hooked up to the organisations secure Wi-Fi network; they might need to be accessing iBleep via the mobile telecomms network, where the Wi-Fi signal isn't so strong. 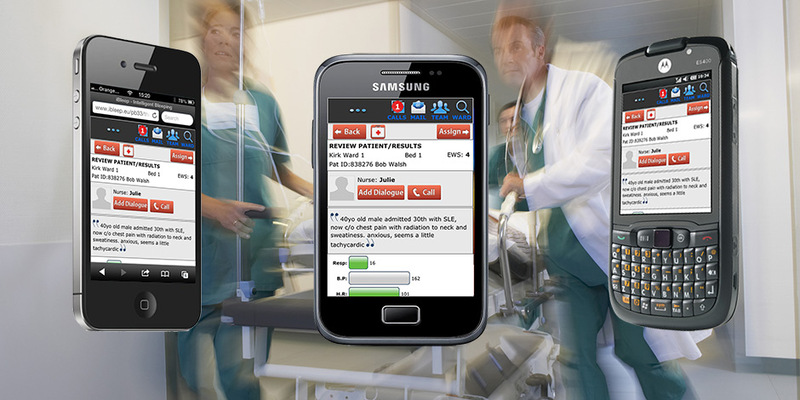 On-call medical staff will require the mobile telecomms networks where no Wi-Fi exists. We have this covered; the iBleep system knows which networks are being used and securely serves up call information regardless. In simple terms, this means that we run iBleep for you over the internet. Our secure dedicated servers provide the application for you without the need for local installation, maintenance or support. We handle the database connectivity, the performance and the backup routines. This is supplemented by a 24/7 support service which guarantees your connection to iBleep without interruption. The local IM&T team need only provide a desktop shortcut to the application and a robust internet connection; we handle the rest. The iBleep system is entirely web-based and hosted on our dedicated servers. Our in-house support team handle all daily system and database back-up routines ensuring that your access to your iBleep application is fully optimised and secure. Additional training and on-site "Go-Live" support is available.